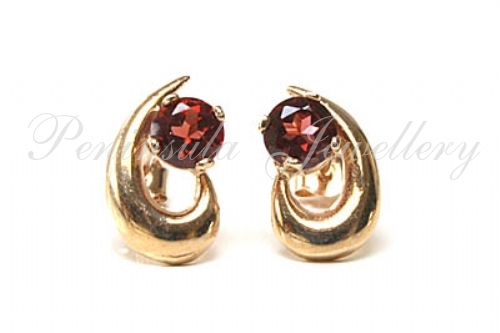 Pretty Garnet stud earrings, each featuring one 4mm round brilliant cut Garnet gemstone, claw set into a polished cut out design in 9ct gold with standard posts and scroll backs. Each gemstone is .20ct. Total dimensions: 11mmx6mm. Made in England. presented in a luxury box - Great Gift! 9ct Gold Turquoise Swirl pendant and chain.